Finding an awesome fit can often be a challenge when there are tons of designers and cuts that are all made differently. Too bad we can’t just have a one size fits all, right? If you’re in the middle of bulking up or down, we’ve got you covered with pieces that will go the distance as you figure out your fit. 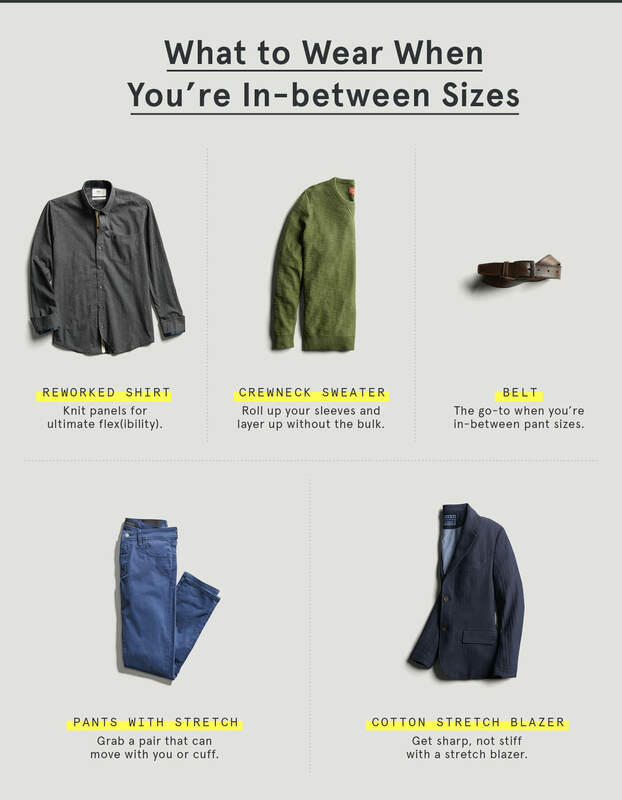 Here’s how to get around the in-between sizes issue. When you’re in between sizes, stretch is your best friend. If you’re running into the issue of clothes being too snug (like your pants), a little added stretch will help your clothes flex with you. A reworked shirt with stretch panels can also help you keep it moving without losing a more-professional look. If you’re running into the issue of clothes being too large for you, stretch clothing forms to your body instead of hanging away from it. When in doubt, size up. When it comes to things like the length of your pants, it’s better to aim long (there’s such a thing as cuffing) instead of going too short. Same with shirts too—having longer sleeves makes it easier to cuff. Finally, start by experimenting with different brands. The more brands you try (and your Stylist sends) the more you’ll learn about what brands fit you best (yes, they can vary). Let your Stylist know you’re in-between sizes and they will do their best to find both cuts and brands that work best for you.